Max and Fang. Fang and Max in the First Book. Wallpaper and background images in the Maximum Ride club tagged: fang max maximum ride hospital. This Maximum Ride fan art contains 애니메이션, 만화, and 만화책. Ha Ha what now fang! thats what you get for being weak! I've seen this picture a millon times, and it never gets old! Happy Heart Monitor! Iggy Blood! Teenage Hormones and Adrenaline! The labels are almost funnier than the actual picture. haha! I love the labels! that is so funny! it describes fang perfectly! teenage hormones... ha ha!!!!! that explains books 3, 4, and 5! ha ha ha!!!!! I'm pretty sure my friend is the person that drew this..... Or she drew a different variation of it. I saw this exact same sketch in her room a week ago, and she said she sent it to her other friend to get it on the internet... Oh, well. Its still funny as hell. That is so funny!" 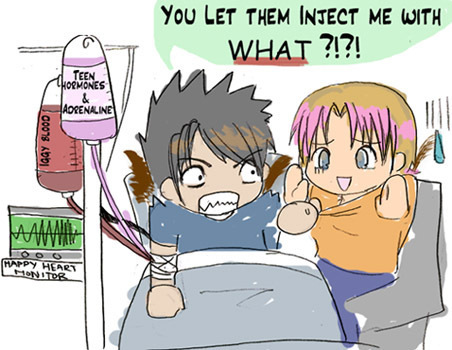 you let them inject me with what?!"